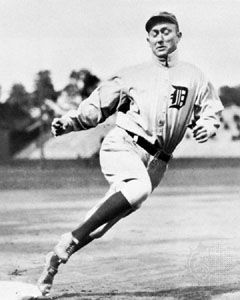 Legendary center fielder Ty Cobb accumulated 145 WAR in his Tigers career. Today, I am presenting the list of top ten center fielders in Tigers history. Other installments in this series can be found at the following links. A player must have played at least half their games with the Tigers as a center fielder or played center field more than any other position. A player must have played at least two full seasons as a center fielder with the Tigers. If a player played other positions with the Tigers besides center field, his hitting performance in those games does count. As expected, the great Ty Cobb is on top of the list with 114 more WAR than runner-up Chet Lemon. After Cobb and Lemon, there is a whole bunch of good but not great players who lasted about five years in Detroit and one guy (Mickey Stanley) who was around for a long time, but didn't hit much. Center field defense is more of a factor than first base or left field, but I still want to look at Adjusted Batting Runs (ABR) which only considers a player's offensive contribution. Batting Runs were first introduced in the Hidden Game of Baseball by John Thorn and Pete Palmer in 1984. It is an estimate of the number of runs contributed by a player compared to an average hitter over the course of his career. This statistic is explained in more deal in the post about first basemen linked above. The ABR statistics is calculated from Baseball-Reference.com as rbat (the batting part) + rbaser (the base running part). The ABR leaders are listed below. By this measure, Cobb is more than 900 runs better than Lemon! Speedy Ron Leflore ranks higher here thanks largely to 34 base running runs. Heinie Manush also does much better on this statistic than he does on WAR where he is dragged down by his poor defense (He became a left fielder later in his career.). On the other hand, Austin Jackson who excelled defensively does not fare as well on ABR. Stanley falls off the charts with -24 ABR. On this list, Leflore drops to #8 (because OPS+ does not include base running) and Austin Jackson is now as low as 10th. Stanley is nowhere to be found here as his 90 OPS+ leaves him behind. Ty Cobb is the easiest choice for number #1 of any position. Much has been said about his character flaws and there are debates about whether he was truly a bad person or just a product of his time period. It's probably some complex combination of both, but there are no doubts about his talents as a player as he is inarguably at the top of the list of the game's all-time greats. He is 4th in lifetime WAR behind Babe Ruth, Barry Bonds and Willie Mays and second in Offensive WAR behind Ruth. He led the American League in batting average twelve times, slugging eight times, OPS ten times and the list goes on and on. Chet Lemon was acquired from the White Sox for left fielder Steve Kemp in 1981 and became one of the important pieces of the successful Tigers teams of the 1980's while Kemp's career was marred by injuries. Lemon was known to do some odd things on the bases like frequently diving head first into first base, but he more than made up for questionable base running with above average offense and excellent defense. In nine seasons with the Tigers, Lemon reached 2+ WAR eight times and 3+ WAR five times. His best year in Detroit was the 1984 championship season where he had a 135 OPS+ and 6.2 WAR. Curtis Granderson is the best home-grown Tigers position player since the 1980s and was a big fan favorite during his time in Detroit. He went out of his way to connect with fans as much as any player since I became a fan in 1968 and he was also talented. He was an above average hitter, fielder and base runner and was 3+ WAR in each of his four full seasons with the Tigers. His best year was 2007 when he was 7.6 WAR and one of only five players ever to achieve the quad twenty - 20 doubles, 20 triples, 20 home runs and 20 stolen bases. Barney McCosky was a lead-off hitter and strong defender who had a .384 OBP and 3.4 WAR as a rookie in 1939. He had an even better year in 1940 batting .340 with a league-leading 19 triples and 4.0 WAR in helping the Tigers to a pennant. He was 2+ WAR in each of his first four years as a Tiger before missing three prime seasons serving in World War II from 1943-1945. If we assume conservatively that he was 2 WAR in each of those three seasons, he would have been 19 WAR as a Tiger. So, he gets a bump on this list for that. Ron Leflore did not begin playing baseball until he was 22 and in the State Prison of Southern Michigan in Jackson, a maximum security facility where they send the worst criminals. He was so talented that a fellow prisoner with connections to Tigers manager Billy Martin helped get him a try out. According to Baseball: The Biographical Encyclopedia by David Pietrusza, et al, Leflore was a given a tryout at Tiger Stadium while on a 48-hour furlough in June, 1973. A year later, he was in the majors and he soon became one of the more exciting players in the game. In 1976, he batted .316 including a 30-game hitting streak and stole 58 bases. The speedy Leflore led the league with 68 steals in 1977. He was 3+ WAR each season from 1976-1979, but was traded to the Expos for pitcher Dan Schatzeder because he became a clubhouse problem. Austin Jackson came to the Tigers along with pitchers Max Scherzer, Phil Coke and Daniel Schlereth in a seven player three-team deal which also saw Granderson go to the Yankees. Jackson was primarily a defensive outfielder but was an average hitter and good base runner. He averaged 4.7 WAR from 2010-2013 (FanGraphs WAR is a little less generous at 3.7 per year due mostly to a different fielding statistic). His best season was 2012 when he had a 129 OPS+ and 5.5 WAR. Jimmy Barrett was one of the players that hazed and infuriated Ty Cobb in his early days as a Tiger. Barrett also wasn't on the best of terms with his manager Edward Barrow. In Barrow's autobiography My Fifty Years in Baseball, he writes that Barrett said to him: "Mr. Barrow, your methods take all the individuality away from a player" Barrow responded: "Young man, if you ever speak to me that way again, I will take more than your individuality away from you. I will knock your block off." So Barrett was not the easiest guy to get along with but he was a solid player both offensively and defensively. Barrett was the Tigers first star in their opening season in 1901 with a 108 OPS+, strong defense and 2.7 WAR. His best season was 1903 when he led the league with a .407 OBP and had an OPS+ of 144. According to Baseball: The Biographical Encyclopedia, Walter Arthur Evers got his nickname because he "hooted" as a baby. Hoot averaged 3.2 WAR and a 125 OPS+ between 1947-1950. His best season was 1950 when he batted .323/.408/.551 with a 141 OPS+. If you think that Heinie Manush is a great name, Hollywood agrees with you. In the 1942 movie Obliging Young Lady, actor Edmond O'Brien repeats "Heinie Manush" to the rhythm of the motion of the train he's riding and gradually the other passengers begin to repeat it as well (IMDB.com). If Henry Emmitt Manush had played his entire career with the Tigers, he would be a high ranking left fielder with a .330 lifetime batting average and 46 WAR. Instead, he is a low ranking center fielder who could hit, but played the position poorly. Heinie's best season was 1926 when he led the league with a .378 batting average and had a 154 OPS+. Fan favorite Mickey Stanley was the opposite of Manush in that he was a very good fielder, but a below average hitter. He accumulated 17 WAR but it took him 13 years to do it. His claim to fame was that Mayo Smith played him at shortstop in the 1968 World Series with little previous experience at the position. The move was made because the Tigers had four good outfielders with Al Kaline returning from an injury and notoriously weak hitting shortstop Ray Oyler. Stanley held his own at short and the Tigers won the Series. Stanley's 1,175 games in center field was second most to Ty Cobb in franchise history.